Liesa graduated from University of Munich, Germany with a masters in linguistics, she has 10 years of experience in business management and marketing in China and Hong Kong as formal senior management in SAIC and other top 500 internet companies in the world. Liesa specializes in market development, brand promotion, and product innovation in Asia. She has been investing in cryptocurrency since 2016 and is an avid enthusiast for blockchain. 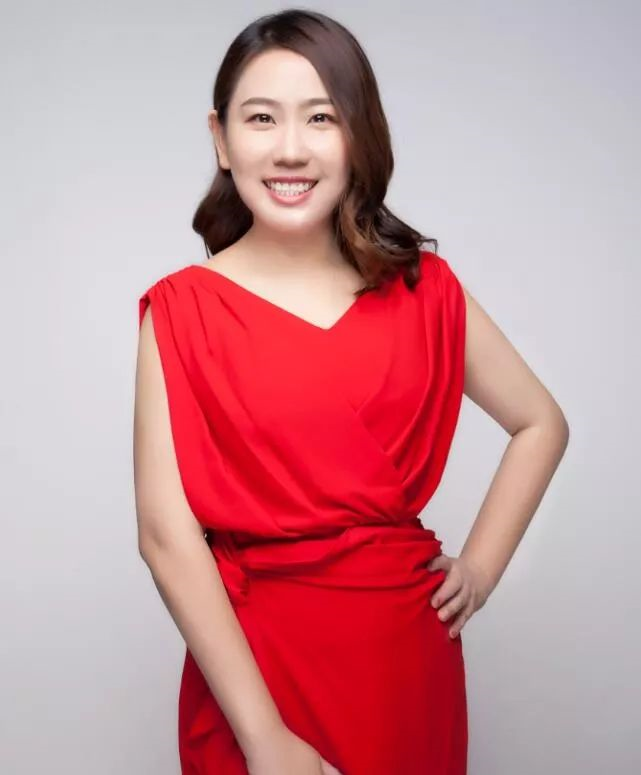 Equipped with an in-depth understanding of token economics and blockchain products, she works to help the world better understand the value of blockchain. NULS is a global open source and community-driven blockchain project, which is a highly customizable blockchain infrastructure. It consists of microkernel and functional modules. 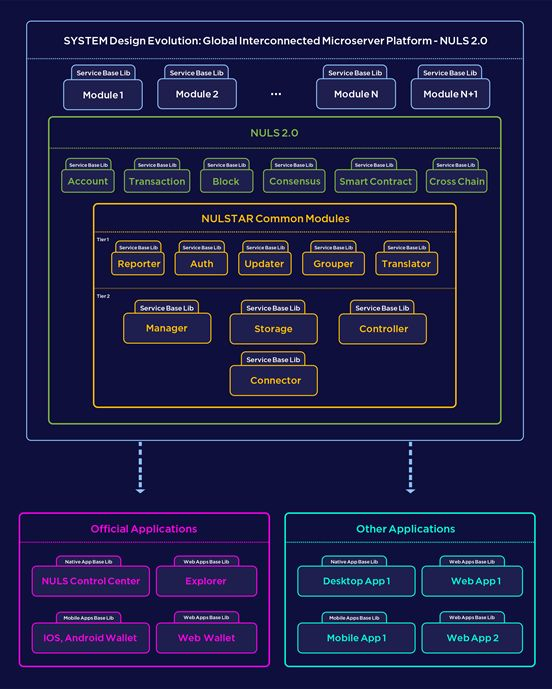 NULS formulates a set of industrial blockchain technology standards, which follow the principles of hot plugging, modularization and parallel extension, and provide functional modules such as replaceable smart contracts, multi-chain parallel, consensus mechanisms, P2P network, storage, encryption, multi-level accounts, etc. Recently NULS released the NULS 2.0 Alpha version — PanGu v1.0, which is based on the micro-service architecture. We c onducted an in-depth interview with Liesa, NULS core team CEO. We hope this interview helps investors who are curious about NULS to gain a comprehensive understanding of the project. 1. Why does NULS2.0 choose micro-service architecture? To begin with, simplicity has been the NULS vision since it was founded in early 2017. We have always been committed to making the blockchain easier, so from the beginning our architectural approach has always been modular, because modularity is by far the simplest solution for chain-building. However, the modular NULS 1.0 version still adopts a monolithic architecture. Those who have maintained a large software system using a monolithic architecture know that when adding a new business function to the system, you must download every module’s code from the repository, deploy it in the IDE, and then develop and test it. Even though there exists part of the code you need in an implemented module, there is no way to call it directly. You have to make a copy, and then modify the copy to realize the new business functionality. This adds a huge complexity to chain-building. Micro-service architecture, on the other hand, allows the ability to split the complex large-scale software system into different layers of modules according to business functionality. Each module can be independently deployed and serves the external systems. Simply speaking, micro-service is a way of implementing the architecture by building the bottom layer to take service as a unit. This underlying idea for better service coincides with our consistent idea of making blockchain easier. Therefore, we choose to upgrade the network and apply the micro-service feature to NULS 2.0. 2. How is one-click chain-building made possible with NULS? What are the features? The Chain Factory is a product that NULS will launch this year that manufactures chains like an assembly line in a factory. It will be implemented using the NULS module repository where anyone can grab the modules they need for the features they want their chain to have, and the Chain Factory does all of the assembling for them. It is a standardized “one-click customized chain-building tool”, to provide developers with the easiest, fastest, zero-threshold chain-building experience possible. 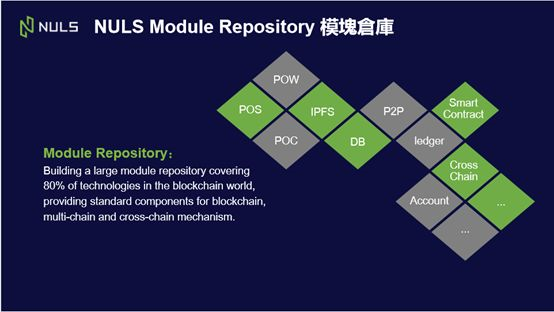 The Module Repository is jointly developed and maintained by the NULS core team and technical community to provide any basic blockchain module such as network, consensus, account, etc. Any developer can participate in the development of any module by sharing their code contributions to the repository. After passing a review, the module may be included in the module repository for public use. With the continuous improvement of the module repository, it will grow to contain an array of general and business modules, and will become a basic development library applicable to different industries, providing complete blockchain solutions for any enterprise. The Chain Factory itself is a blockchain whose nodes can run multiple chains at the same time. In this way, the blockchains built using the Chain Factory can run directly on the nodes of the Chain Factory, which saves the trouble of setting up the operation environment of nodes, and greatly reduces the time and cost of development. Pay a deposit and broadcast a chain-building transaction. After the confirmation of the transaction, the new chain will be built instantly. Through the user-friendly interface provided by the Chain Factory, enterprises and developers only need to go through a simple configuration to build a chain with ease and efficiency, leading to significant savings of both time and cost. When adding new modules while using the Chain Factory’s nodes to run your blockchain, the node will automatically determine whether a module you selected already exists. If not, it will be downloaded from the Module Repository and run automatically. You can also choose to set up your own nodes to run your blockchain. 3. What are the highlights of the NULS cross-chain solution? The cross-chain solution is based on the main network, whereby all blockchains only communicate with the NULS main network. 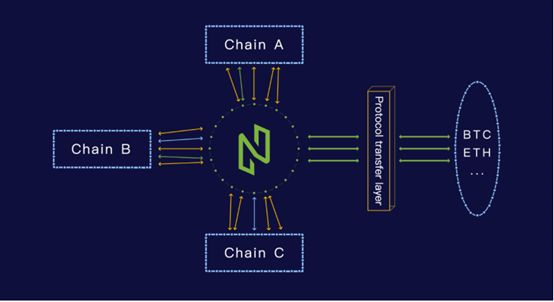 The verification of the transaction is performed by the NULS main network and each parallel chain trusts the verification results. Every blockchain developed on NULS can directly select the cross-chain module and integrate it into the system to realize cross-chain functionality. The cross-chain module implements the NULS cross-chain protocol, which can easily communicate with the main network, and then transfer assets to other parallel chains through the NULS main network. For Ethereum, Bitcoin and other public chains, NULS provides a common protocol conversion layer to enable them to communicate with the blockchains in the NULS ecosystem. The protocol conversion layer can communicate with public chains such as Ethereum and the NULS main network chain as well, to realize intercommunication with other parallel chains in NULS ecosystem in an more indirect way. The NULS cross-chain consensus is mainly achieved through SDK and protocol, which provides a very simple and fast cross-chain capability. 4. Why does the blockchain industry need NULS 2.0? What innovative breakthroughs will it bring to the industry? 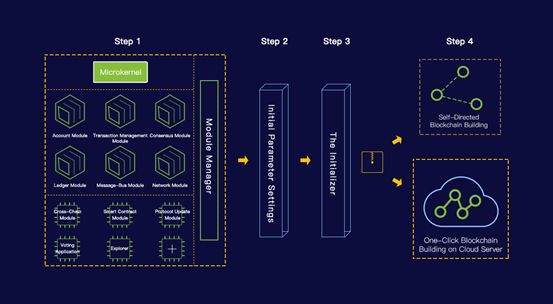 The most prominent feature of the NULS 2.0 is the integration of micro-service into the underlying design of blockchain. As mentioned before, the overriding value of micro-service thinking is business orientation. Blockchain technology is evolving to the point where the very real demand is the application. In the Internet era, the product manager plays a proverbially leading role in a project. The technology cannot be the only focus of the blockchain to enter the era of blockchain products. Therefore, NULS 2.0’s technical concept specializes in the product thinking and product concept, which provides the greatest level of business separation with the strongest level of technical support for future blockchain product managers. This is a fairly new kind of underlying design concept in blockchain technology. 5. NULS 2.0 is a project that encourages deep participation by the technical community. Why does the NULS core team favor a technical community to guide the NULS network? What are the difficulties and benefits of doing so? We humbly believe that even the strongest team has weaknesses. One of the great gifts that the blockchain offers to the business world is community cooperation and decentralization. Although immature, it is worth exploring and developing. The community is deeply rooted in the NULS project, and we have accumulated many excellent technical community programmers from all over the world who are also eager to join us in the bottom layer of development. The technical community joining the core team to do the underlying design and development is a great way to utilize the best assets of a team and build a community of contributors. It also attracts more possibilities for the future technical development of NULS. So, in spite of the many difficulties of language, time zone, and cultural differences, we push through the wild working hours, and enduring work habits because the global technical development of NULS is a major principle we adhere to and prioritize. Our strong work standards and resolute habits will affect others in the collaborative process as we standardize the design and development of NULS. 6. What is the layout of the global business cooperation after the release of the NULS2.0 Alpha version — PanGu v1.0? NULS has business teams in the Greater Bay Area of Silicon Valley and South Korea. Many of the first test users of PanGu v1.0 are from the Greater Bay Area and South Korea. NULS 2.0 is targeted at blockchain developers and enterprises. So we will start from the broader technical community coverage and enterprise communication to embrace the global users with a need to build a chain, and will timely optimize our products based on their feedback. 7. Recently (on March 27) BlockGroup, the parent company of BlockVC, established a $200 million acquisition fund and strategically invested in NULS. What do you think they suppose is the greatest value of NULS? As mentioned in the BlockGroup announcement, the blockchain industry still lacks a fully-fledged infrastructure development suite of underlying frameworks and modules, as well as any technical standards. NULS greatly helps shorten the development cycle of blockchain and lowers the technical threshold, which is what the BlockGroup values most about NULS. They were impressed by the agility that micro-service lends to blockchain. The scope of application goes far beyond the public chain, its also applicable to consortium and private chains, and is suitable to businesses of any size. The principles that the NULS core team adheres to, such as technical community development, and being fully devoted to applying the strength of the technical community by integrating its strongest members into the underlying core development process, means that a good framework of community autonomy will flourish through exploration of the core features, and advance the governance model of NULS. These principles are highly consistent with BlockGroup’s concept of the blockchain. The blockchain is still in its infancy and the combination of blockchain development with global technical community development creates a fusion of human capital and decentralized projects that can provide a powerful push forward for the the whole industry. 8. How can NULS still focus on the technical update, iteration and breakthrough in such a market? Actually, the NULS team didn’t really pay much attention to the secondary market. We’ve been involved in our mission and goals since 2017. This may sound hollow, but it is true. Whether code submission of NULS 1.0 in Github or a redesign of it into the NULS 2.0’s micro-services layer, the way our technology product team works is completely immersive, because its the only way to be exceptionally focused and to succeed. You can see this in the Github repositories of NULS core and the technical community, the amount of code produced by the team rivals even the biggest projects. We all know that our technical product team is not large, but the modular architecture we intend to do based on the micro-service is extremely advanced. This will allow the global technical community to be fully involved in the underlying development, and it may take some time, especially for Chinese programmers. So we have to focus, and stay immersed, to be fully involved so that in this way we can accomplish what we want to achieve. 9. Many investors said NULS 2.0 will be one of the most promising projects in the next one or two years. How does the NULS team regard it? Technology. We all know that there are many solutions for the bottom layer of the blockchain. The module infrastructure of the NULS 2.0 micro-service supports the chain-building, multi-chain and cross-chain products. In fact, we have seen similar architectures in Baidu, JD and other enterprise-level solutions. This also indicates that NULS will probably be one of the most popular and user-friendly schemes of blockchain product. Community governance. I think that the community governance aspect of blockchain adds a special charm to business models throughout the past 20 years. The project that can regenerate its own core developers and other technical and community members as they phase in and out during its lifetime of autonomy is a truly valuable and secure blockchain project. NULS has emphasized a lot on community construction since its establishment. We still have the continuous optimization and improvement of our community governance model to polish. The establishment of the Community Constitution, Board of Directors, Ambassadors, as well as our global technical community, allows engagement at every step of development to direct and secure the future of the NULS project. Once we complete the development of the NULS community governance model and make on-chain governance completely feasible, the 20 million in our community fund will work to further ensure the future sustainable development of the NULS community. Global outreach. Those who are familiar with NULS know that we are a global operation, and so I travel to the United States, and South Korea, from China all year round. One of the biggest values of blockchain lies in globalization. Both the circulation of globalization and the integration of global communities reflect the business value of the whole industry very well. So we will stick to our global strategy. The first batch of NULS 2.0 Alpha enterprise users are from the United States, South Korea and Europe. This year, we will increase cooperation with even more international partners. Value circulation. The general consensus is that a blockchain’s token realizes its value via circulation, so circulation is a closely-watched metric. NULS is also a financial product listed on an exchange with the largest international circulation and trading volume (Binance). Therefore, it is also one of our goals to focus on value circulation and make the NULS token intrinsic value reflected in the circulation. These four points are the core team’s opinions on the value of NULS. As mentioned before, our current goal is to enter the top 20 in terms of market cap. Of course, market cap is a very important indicator in the long run, so it is somewhat meaningless to keep a close eye on the short-term fluctuations. If you ask me, the innovation, change and influence that NULS can bring to the blockchain world is of great value in itself, and is also one of most prominent and frequently occurring reminders the team gives ourselves, which we call the ultimate problem we are forced to face. So we have no choice but to realize through achievement the way we want to advance a blockchain-driven world. Finally, thanks again for your recognition and attention. The best reward for us all is the encouragement of each other in this endeavor.